The Disney Store opens on Manhattan's Fifth Avenue (the largest Disney Store to date) and sets the all-time record for single-day volume in a Disney Store. been, and wouldn't be, the same without him. His voice was one of the things that made it all come alive." Writer, cartoonist & animator George Baker is born in Lowell, Massachusetts. feature film (starring Jerry Lewis). the other animals are eating! The 21st episode of MMC airs on Disney Channel. Today is Music Day! "Where the Dream Takes You", performed by Mýa. remain on display at the venue through Tuesday, July 20.
of Rani on the animated The Lion Guard (based on Disney's 1994 film The Lion King). on records. (It is also Ravenscroft's deep voice you hear singing "You're A Mean One, Mr. Grinch"
Retired Disney animator & director Wolfgang "Woolie" Reitherman (one of Walt's "Nine Old Men") passes away suddenly in Burbank, California at age 75. In 1963, Woolie became the first animator in the history of the company to be given the directorial reins of an entire animated feature, beginning with The Sword in the Stone. He will be named a Disney Legend in 1989. Disney's animated feature Pinocchio is released in France. and songs from Disney's first animated feature film. finish at New York's Grand Central Terminal over the weekend of October 30th through November 1st. City, Los Angeles, San Francisco and Palm Desert, California, for a limited run. this weekend's celebrity guests include Ray Park, Warwick Davis, and James Arnold Taylor. be perfect for a new Disney resort/theme park. After touring the land ... Foster is impressed. is not a common event and much preparation is needed. Mayfield and starring Brendan Fraser, Sean Astin and Pauly Shore. One of the most popular and entertaining parts of the annual Star Wars Weekends events at Disney’s Hollywood Studios is the day-ending performance of Hyperspace Hoopla. The highlight of this character-filled show is the Dance-Off with the Star Wars Stars during which characters from the Star Wars universe have a chance to bust a move to popular songs. wealthy employer, but when she moves in, her low class family upsets the snobbish relatives of the deceased. They plot to get rid of the entire clan of Munceys. Disney's newest live-action feature Tomorrowland opens in U.S. theaters. dangerous mission to unearth the secrets of "Tomorrowland," an enigmatic location caught between time and space. "Coolest Summer Ever" takes place in Magic Kingdom Park at Walt Disney World Resort. A 24-hour party, the special event starts 6 a.m. Friday, May 22, and runs until 6 a.m. Saturday, May 23. Snow White in the ABC series Once Upon a Time, is born in Memphis, Tennessee. passes away at age 92 in California. Stevens began his career Inbetweening on the 1940 film Fantasia. Hound (1981). 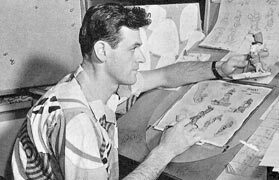 He retired in 1983 after forty-three years at the Disney animation studio.